The following is a guest post by Randy from Arkansasgambler.com. Randy had one of his interns work on capturing email leads for his Twilight news site. 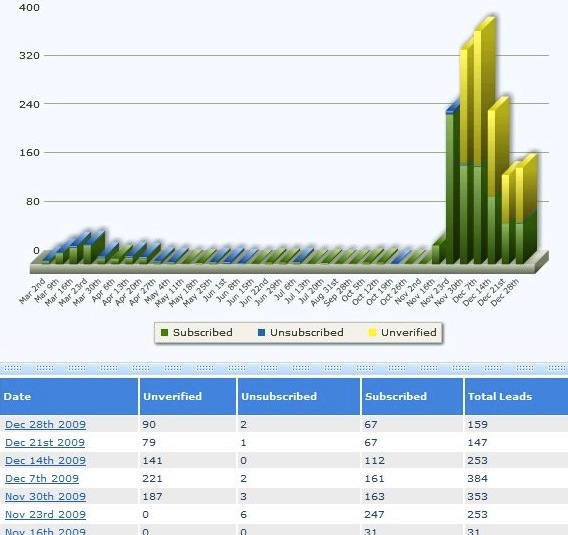 The campaign has been very successful, so he is sharing what he did to increase email subscriptions by more than 700% in 3 weeks. The Twilight craze has been a welcome addition to my web portfolio. About a year ago, I started a Twilight news and gossip site for my wife and family to play with. I set up a WordPress template and let the ladies go to work. As my wife was adding content, I began to monetize the website with a variety of products including Google AdSense, eBay, affiliate products, and an email subscriber list. After just a few short months, the site was getting good traffic. Some days it was getting 2000 to 3000 visitors. At this point, the site was doing well, generating a little bit of money each day without a lot of effort. Unfortunately, it ended up taking a back seat to some other projects. My main niche is the gaming niche, and I had a lot of gaming opportunities that needed attention just as the Twilight site was becoming established. My Twilight site began to fall out of favor a bit, but it continued to churn out a few dollars per day in commissions, with no attention being paid. Besides generating a little bit of cash, I was also collecting a few email addresses per day. Back when I created the site, I had quickly set up an Aweber Lightbox form. Even though the campaign was only capturing a few leads per day, the people who signed up were very responsive to any updates we were sending them. Each time I sent out a letter to the subscribers, a good percentage of them opened the email, and clicked on links that were embedded in the email. This consistently resulted in a few sales, as well as increased activity on the main site via the linked articles. A few weeks before the second installment in the Twilight series was released, organic traffic began to increase on the site. I had my programmer install a new template that was more optimized for AdSense and the other banner ads on the site. This resulted in a 4 time increase in AdSense revenue per visitor, and a small increase in affiliate sales through banners. 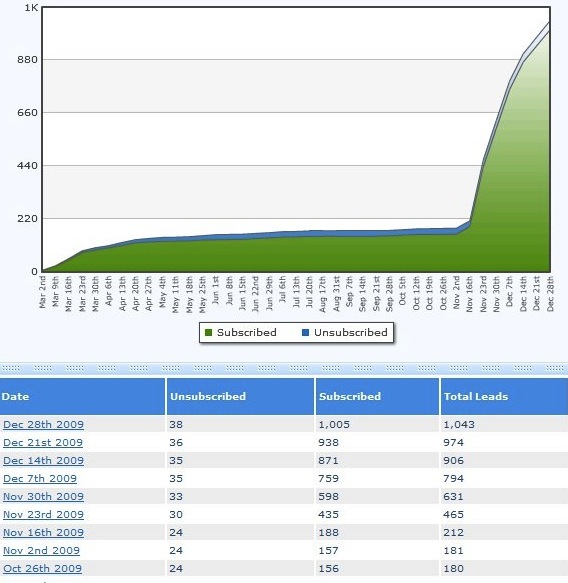 At this point, 1-3 people per week were signing up for my email newsletter per day. Being the lucky guy that I am, I had been approached a month prior by an old friend of mine in the gaming industry, Greg. Greg is working on his own sites right now, AirbenderGear.com and SteelersGear.net, but he had not yet started those sites and was looking for something to do. He had just finished setting up an email capture campaign for me on one of my poker strategy sites and the campaign has been doing really well. I figured it would be a good idea to have him look at the Twilight site to see if he could jump start that email campaign. After looking through Aweber for a few minutes, he wrote to me on Skype saying that he â€œjust wet himself.â€ I would soon find out why. We knew that it was possible to increase conversion rate, even for a less targeted campaign like the Twilight campaign. So I had Greg set up a split test. He made four different forms, and we let them run for about a week. One form was the original one, one was a slightly modded version of the original, one had a picture of Taylor Lautner, and one had a picture of Robert Pattinson. Every time a unique visitor landed at Twilightgear.net, it triggered a rotation of one version of these forms (This is super easy to set up in Aweber). After about 100k unique visitors, we had a clear winner. For whatever reason, unexplainable by us, the Robert Pattinson form converted four times better than all the other ones. The other three forms In the split test maintained a less than 0.5% conversion rate, while the Robert Pattinson form converted at 2%. We ended the split test, and let the RP form run 100% of the time. Finding a higher-converting email signup form was something I’m glad I did, when I did. As Twilight: New Moon approached, TwilightGear’s traffic increased by nearly 10x. There were days where I was getting 30k uniques. I had to upgrade my server just to keep up with demand. The implementation of the new email signup form allowed me to take full advantage of the high traffic. The first day that I implemented the new form, over 100 people submitted their email address into my form. Even though the traffic has dwindled a bit over the past few weeks, and will probably continue to dwindle, I’m still seeing 20-30 people per day submitting their email address. If you have a site that is related to a big event, do some optimization and take advantage of the anticipated increase in traffic. For me, a new twilight movie means huge increases in traffic. I did some optimization before New Moon came out which resulted in big increases in my short term and long term bottom line. This can be applied to all sorts of industries besides movies. If you have a site about an NFL team, do some optimization testing before the NFL draft, before the season starts, or before the playoffs start if the team will make the playoffs. If you have a site about tournament poker, do something related to the WSOP before it starts. Split testing is very important. The most important word in the previous sentence is TEST. Like I said before, I had no idea that a Robert Pattinson form would perform better than a Taylor Lautner form. The only way to find this out is to test. When people say stuff like â€œthe key to internet marketing is to not give up,â€ this is what they are talking about. You won’t succeed every time you try something, but you will find something that works if you keep trying to make something work. Almost every traffic source has a combination of things that can be made to work with it. I am writing a follow-up article based on the next step in optimizing this email list. The percentage of people who enter their email address into the signup form, then opt-in (confirm by clicking on link in email) is hovering around ~40% for the Twilight list. The poker strategy list opts in at more than double that rate; nearly 90%. What’s the difference between the two lists? The poker strategy list offers an incentive for joining; a poker strategy guide. The next step for the optimizing the Twilight list is to offer an incentive for joining. I’m not exactly sure what that incentive will be, but I’ll think of something, and then I’ll let you know how it goes. If your blog doesn’t have an email list, you are leaving a ton of money on the table. My mailing list is the number one reason why my blog makes income that it does. Aweber is the best email service I have ever used. Their feature set is beyond anything else in the industry and this new Web Form Generator just put them another light year ahead. Aweber offers a $1 trial account for all new customers. The account is just like a normal Aweber account and includes unlimited email campaigns, newsletter, broadcasts and follow ups. It’s a great way to test drive Aweber to see what it can do for your blog. Your satisfaction is guaranteed. If you find that email marketing is not for you, contact Aweber within 30 days and they’ll give you the $1 back.